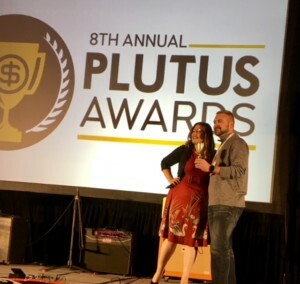 Home Blog 2018 September 18 Why Do We Love The Plutus Awards? Millhouse, is a finalist in the category, Best New Personal Finance Podcast. We also love the fact that the Plutus Foundation recently gave Heroes at Home a grant for our free financial education among service members. Last year’s Plutus Awards emcee, Bethany Bayless, who is also the co-host of The Money Millhouse wrote the following blog that explains the background on the podcast and the grant. That statement is what compels the Heroes at Home team to continue their mission to combat financial illiteracy on military bases. It is also what persuaded Ellie Kay to found Heroes at Home, a non-profit organization that holds free Financial Education Events on military bases around the world. To tell the story of Heroes at Home, one must always start with Ellie Kay, the founder and CEO of Heroes at Home, 501c3. When Ellie married her husband 30 years ago, she got what she calls “a 3-for-1 deal.” She married the worlds greatest fighter pilot, and gained two step-daughters. Her husband, Bob, said, “Let’s join the active duty Air Force and we can see the world.” Ellie left her job as a broker and signed up for this life of adventure. What Bob showed her was 5 more babies in the first seven years of marriage and 11 more moves in 13 years. Ellie also married into $40k of consumer debt. When they joined the active duty, Bob had to take a $30k a-year-pay cut, and Ellie had to quit her job as a broker. With child support and paying down debt taking up two-thirds of their single income, they were making the equivalent of an Airman First Class’s salary as a Captain in the Air Force. While being pregnant and constantly moving, Ellie made it her mission to save money by cutting coupons and keeping her family on a strict budget. Through her diligence and perseverance, she was able to take her family to financial freedom and a debt-free life in 2.5 years. 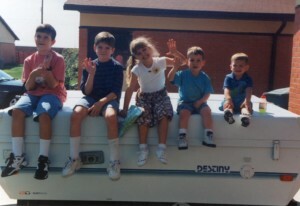 They have remained debt free ever since. Using the concepts she learned through this journey to financial freedom, she started teaching others to do the same. Years later, she is now the best-selling author of 15 books, her work has reached one million people and as a popular international speaker, and she has delivered messages to 2000+ audiences as large as 10,000 people. As a media veteran, she’s given 2000+ media interviews including CNBC, CNN and Fox News, and her Heroes at Home program has reached thousands in the hopes to bring hope, help, and humor to military members and their families stationed around the world. It was out of this that the Heroes at Home non-profit was born. 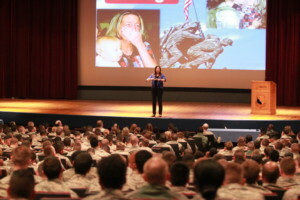 While Ellie and her team was giving a Marine Corps spouse oriented presentation, a member of the A1 Air Force Leadership sent a representative to see the event in Quantico. They loved the message so much, they said that if Ellie was able to make a financially-centric event, they could roll it out to the Air Force. What they came up with was a 2-hour presentation that was different than typical financial briefings. The program has 4 high-quality speakers that kept the material concise to fit in their 20-minute segments, while remaining entertaining and accurate. They cover a range of topics including general budgeting, credit reports and scoring, and saving for retirement. 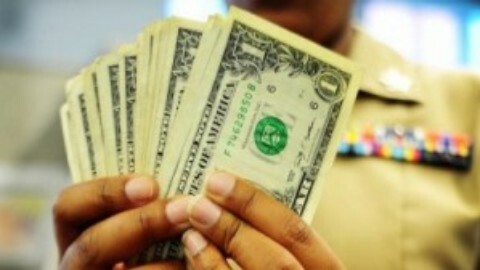 Though this program is geared mainly towards young Airmen, even senior ranking service members are able to learn new money-saving techniques. In between each presentation, high-energy-millennial Emcee, Bethany Bayless, gets up and shares her favorite tips and tricks to save money via-apps and popular websites through a very unique presentation style. She also conducts a live Twitter party for each event, where audience members are able to tweet their favorite moments of the show. This allows them to stay engaged as the presentation goes progresses. At the end of the event, sponsors provide free gifts and door prizes, including books, gift cards, and in some cases, an iPad mini, are given away. Partnering with USAA to start their events, the Heroes at Home team conducted their first Air Force tour to six northern-tier bases in 2015—often holding 2 separate events in one day. Thanks to corporate and private donations and grants from organizations such as The Plutus Awards, Experian, USAA and Credit.com, the team is able to provide this event completely free to all its attendees. In preparation for each event, Ellie and her team fly out two days ahead of time. The day before the presentation, the team meets with Command Leadership to discuss base-specific issues to better understand the financial challenges as well as the mission of the installation. Through these meetings, they are able to tailor make each presentation to fit the needs of the men and women who serve on that base. After the Command Meeting, the team embarks on a tour of each base. On these tours, the team is able to get hands on experience and meet Airmen face to face as they are on the job. It is through these tours that the team connects directly with the service members of the base. They have toured nuclear missile silos, visited flight lines, met working guard dogs, flown various flight simulators, and much, much more. The most significant thing that makes Heroes at Home unique and different than any other financial presentation is the final segment of the show given by Ellie. She draws on her experience as a 30-year spouse of an Air Force fighter pilot and the mom to three active duty military sons, including a Marine Infantry Officer, an Air Force fighter pilot and a Mechanized Infantry Army officer. Ellie shares the 5 characteristics of a Hero and their Heroes at Home: a sense of humor, patriotism, courage, faith, and a legacy. In this powerful part of the presentation, Ellie’s unique, powerful speaking style literally brings both laughter and tears to her audience. This final segment of the show has nothing to do with financial education, but everything to do with encouraging the military members and their families. The main message: We love you. We are proud of you. And Together, we are going to be okay. 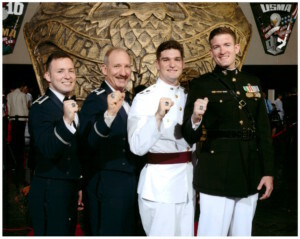 Since their pilot tour in 2015, the Heroes at Home Financial Event has been conducted 51 shows on 33 bases in four countries with sponsorships from The Plutus Foundation, USAA, Experian, and other philanthropic sponsors. The Heroes at Home tour recently concluded their final event of the season at Pensacola Naval Air Station, speaking to an Air Force detachment stationed on a Naval Base. The room was filled with 300 uniformed military members listening to the presentation in the midst of the pending tropical storm Gordon. After working in the space for several years, the Heroes at Home team also developed a fun, upbeat, podcast, The Money Millhouse, which is a high-energy show geared around money conversations. 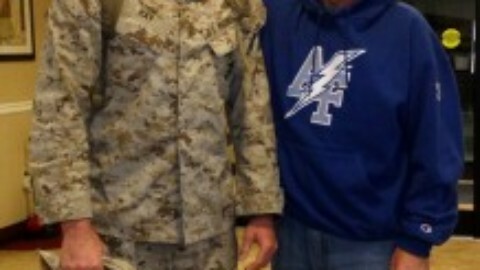 To find out more or to donate to Heroes at Home, please visit heroesathome.org. To find out more about the podcast, visit themoneymillhouse.com. Kids and Money — Listen to Ellie on Voice America!